The RT Engine - An engine for doing realtime signal processing. The RT Compiler - A compiler for a scheme-like programming language to generate realtime-safe code understood by the RT Engine. 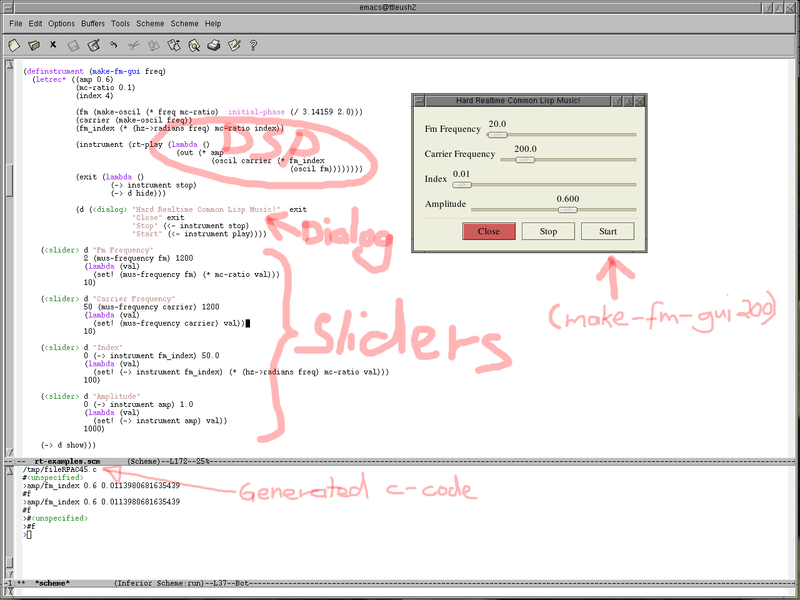 Emacs lisp code for Snd-RT and Snd. Extending Snd with Eval-C and Snd-RT. Source code for the examples. Implementing a Polyphonic MIDI Software Synthesizer using Coroutines, Realtime Garbage Collection, Closures, Auto-Allocated Variables, Dynamic Scoping, and Continuation Passing Style Programming. Examples of creating GUIs in Snd-RT. San Dysth. A standalone soft synth written using Snd-rt. Cmdist -- Common Music, CLM, CMN, Snd list. Mailing list. Note that to avoid too many unwanted surprises, please use Snd-ls to run Snd-RT, and not Snd. Snd often works as well, but Snd-ls is the supported distribution which I also use myself when developing Snd-RT.